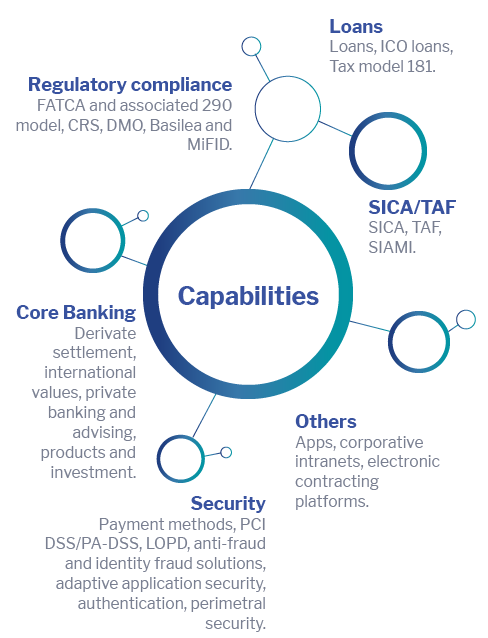 Financial entities face new future challenges. The crisis lived in the last years has supposed relevant global changes, where the concentration and reconversion of the sector and the boost of new technologies have created a new ecosystem. This new ecosystem is characterized by the transformation of business models, result of the digitalization; the appearance of new competitors like new fintech or insurtech enterprises; and new requirements of more exigent and informed clients. Costs reduction, new technologies, innovation and the adaption to this new ecosystem are key issues that all financial entities must approach quickly. working for the main financial entities of the country. with experience and wide technological and business knowledge. we participate in all the life cycle. Professional services and technological assistance. Information and EndPoint security solution.